Draper Soft Grip Ratchet 3/8"
Forged from chrome vanadium steel hardened, tempered and satin finish. 72 tooth ratchet with lever forward/reverse selector and quick release mechanism. Spring-loaded ball bearing for secure socket holding. Soft grip handle for user comfort. 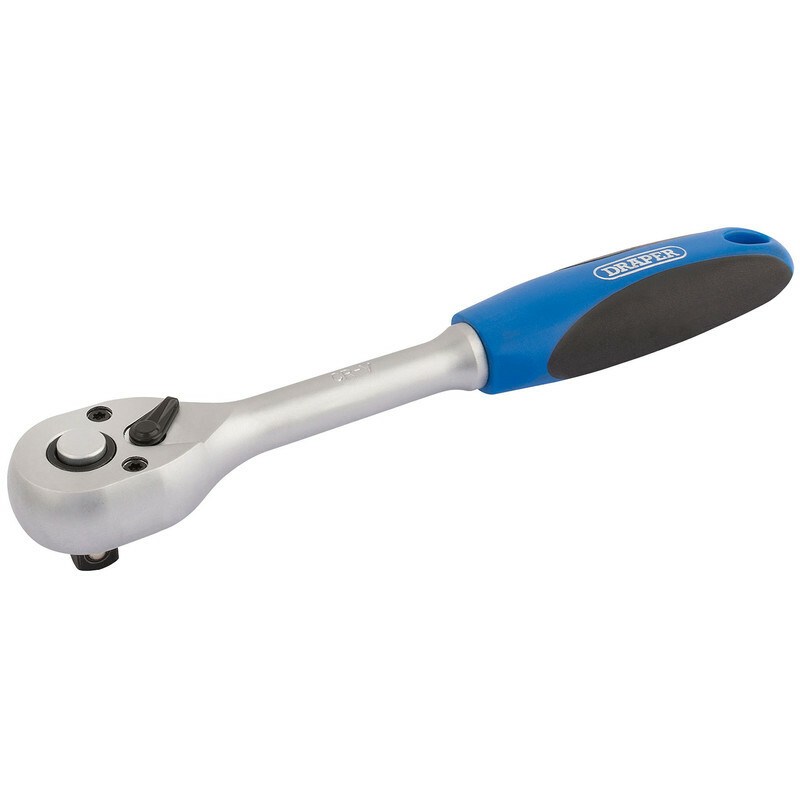 Draper Soft Grip Ratchet 3/8" is rated 4.9 out of 5 by 8. Rated 5 out of 5 by Ronniel from Lovely wee ratchet I bought this as part of my emergency toolkit aboard my motor cruiser. I've got other ratchets from high-end brands such as Snap-on and Facom which I use in my workshops. I didn't want to spend a lot on this item as it will only be used occasionally. However, for the price it's a lovely little item. Well finished, nice ratchet action and a quality feel to it. Draper tools are really good quality at an affordable price and this is a good example. Rated 5 out of 5 by Carbon Brush from Works Well I have been using one of these for a couple of years. Good smooth action and reliable - unlike many. Recently bought another as a gift. Rated 5 out of 5 by JonH from Just the job Bought this to put together a large climbing frame with lots of bolts needing to be screwed into wood. Hard work with a normal spanner, easy with this. Rated 5 out of 5 by Dennis is my nickname from Quality tools I ditched my old set of ratchets for these new Draper ratchets and am well chuffed that I did, as they are so much easier to use and are far more comfortable (and warmer!) in the hand.